A family dentist is a general dentistry practitioner who is happy to offer patients of all ages, from 1 to 101, comprehensive dental care to keep them smiling year after year. 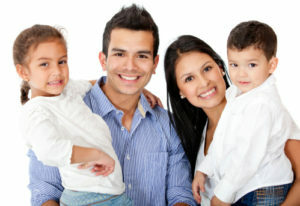 Family dentists do their utmost to make caring for the dental health of every family member convenient. With a focus on prevention, we partner with every patient we see to keep their smiles whole and healthy at every age and stage of dental development. Don’t Kids Need to Visit a Pediatric Dentist? Most kids don’t need to see pediatric dentistry specialists. Like other dental specialties, we refer young patients to a pediatric dentist if they need specialized treatments. In the early stages of treatment, we may notice that kids have developmental concerns like teeth that don’t erupt, severe jawbone or facial distortion, and other serious issues. For the majority of young patients, this won’t be necessary.